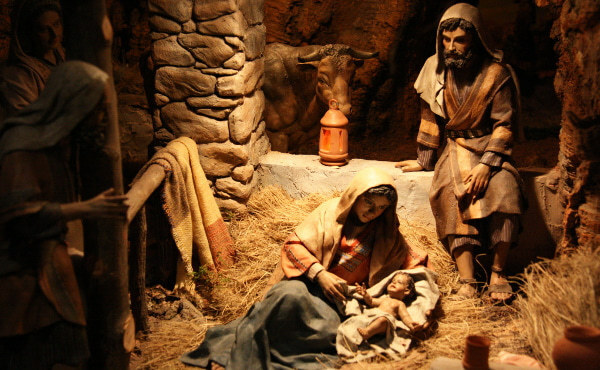 Prologue to “The Christmas Crèche, its Figures and Symbols,” an exposition organized by the Santa Clara Royal Monastery in Carrión de los Condes, Spain. 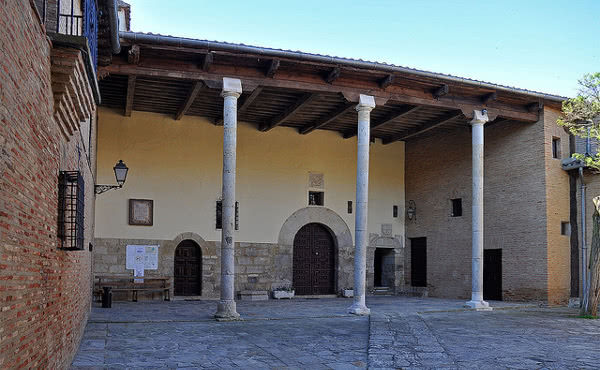 Once again this year the Santa Clara Royal Monastery in Carrión de los Condes has organized a large exposition of Nativity scenes for the great feast of Christmas. This is a very worthwhile initiative that I am happy to bless, since it meets an especially pressing need: that of reminding the world of the fundamental fact that has united heaven and earth—the birth of the Son of God, made flesh for us and for our salvation, as we profess in the Creed. Also in our day it is very necessary to “resurrect” in the hearts of believers the conviction that the eternal Son of God, moved by his mercy (by his condescension, as the early Fathers of the Church said), truly became one of us. He has taken upon himself our weaknesses, except for sin, to redeem us from our faults. The holy and eternal God, who cannot die, became man in order to suffer death like us, and thus free us from the devil’s tyranny and make us children of God. The liturgical celebration of Jesus’ birth, with all the many manifestations of popular piety that accompany it, is a moment of great importance for enabling this truth to shine forth before the eyes and in the hearts of the Christian people, and also for so many men and women who, throughout the world, celebrate Christmas in some way even without realizing its full meaning. Therefore setting up the Nativity scene in homes and in cities is a strong sign of faith, capable of awakening a world that is running the risk of forgetting the eternal realities and focusing only on what is passing. 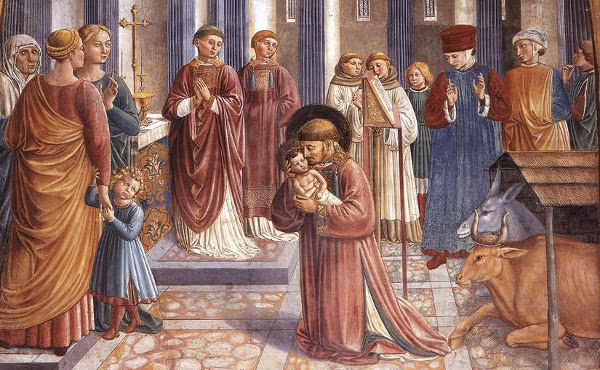 Let us try to revive in ourselves the same wonder and enthusiasm that St. Francis had on that Christmas night in Umbria. The Greek root of the word “enthusiasm” contains a reference to the divine inspiration stirred up in those who receive it: passion, joy, wonder, rapture, fervor of spirit... And this really happens when we consider the meaning of the birth of the Child in Bethlehem. His lessons of humility, poverty, abandonment, are always timely, and perhaps more so in our day and age, marred by tensions that lead to forgetting about God and rejecting our neighbor. In the Child Jesus the God who is Love is made manifest: a defenseless God, who renounces the use of force, because he wants to be accepted freely by mankind. His birth amid the poverty of Bethlehem, unnoticed by anyone, except Mary and Joseph, speaks to us of the urgent need to get out of ourselves in order to place ourselves joyfully at the service of others, especially those in most need. “Truly, I say to you, unless you turn and become like children, you will never enter the kingdom of heaven,” our Lord said (Mt 18:3). In order to truly understand the mystery of the Nativity, we need to foster the attitude of a small child, who puts his trust entirely in his father and mother, and strive to become like the eternal Son of God, made the son of man. But let us not view what happened at Christmas as something distant in time, which only on these special occasions becomes relevant again. As St. Josemaría de Balaguer, founder of Opus Dei, wrote when he was still a young priest: “The humility of Jesus: in Bethlehem, in Nazareth, on Calvary. 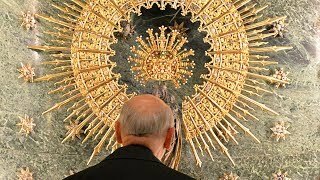 But more humiliation and more self-abasement still in the Sacred Host: more than in the stable, more than in Nazareth, more than on the Cross.” He stressed over and over again, always with new accents, that the crib of the Infant God is a teaching chair for all the virtues. And this holy priest taught us that, just as in those first moments of Jesus’ earthly life, we also find our Lord defenseless in the holy Mass and in the Tabernacle. There Jesus awaits our gratitude, our company, our enthusiasm before the reality of a hidden God, who deigns to remain with us to the end of time, hidden under the veil of bread and wine. Let us ask God the Father, under the guidance of the Holy Spirit, that on this great feast of Christmas we may learn to recognize Jesus in our neighbor—in the sick, in the poor, in those who are persecuted for the sake of righteousness—and that we may accompany him in the Tabernacles where he really dwells out of love for us. This is the desire and the prayer that I raise up to heaven, asking God for abundant grace for all Christians, in a special way for those who decide to honor the birth of the Son of God by setting up a Nativity scene in their homes, or by piously visiting such a scene in any corner of the world. Thomas of Celano, Vita Prima, no. 63. Benedict XVI, General Audience, December 23, 2009. St. Josemaria, The Way, no. 533. See. St. Josemaría, The Way: Critical-Historical Edition, edited by Pedro Rodriguez, Scepter, 1st ed., London – New York (commentary on point 998).